Rails-to-Trails Conservancy (RTC) today announced its vision for the Great American Rail-Trail, an unprecedented commitment to creating an iconic piece of American infrastructure that will connect nearly 4,000 miles of rail-trail and other multiuse trails from Washington, DC, to Washington State. Rails-to-Trails Conservancy (RTC), the nation’s largest trails organization, has announced its vision for the Great American Rail-Trail, an unprecedented commitment to creating an iconic piece of American infrastructure that will connect nearly 4,000 miles of rail-trail and other multiuse trails from Washington, D.C., to Washington State. Learn more at www.greatamericanrailtrail.org. RTC is committing to this project after more than 18 months of analysis and collaboration with local trail partners and state agencies whose work is critical to the success of this significant undertaking. Analyses that were used to confirm the project’s viability included a thorough assessment of route options using RTC’s database of more than 34,000 miles of open trails nationwide; analyses of state and local trail plans; and discussions with hundreds of local trail partners and state agencies representing all of the trails along the potential route. Separated from vehicle traffic, Great American Rail-Trail travelers will be able to experience the diversity of America’s landscape, its people and its places as the route traverses 12 states moving west from its start in Washington, D.C. 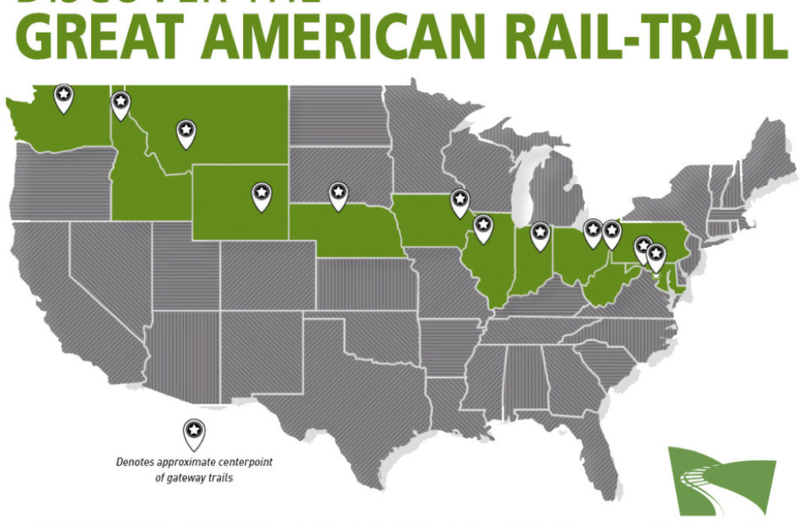 While the full route for the trail won’t be released until spring 2019, RTC today revealed the 12 gateway trails that make the Great American Rail-Trail possible. For more details about the Great American Rail-Trail, visit greatamericanrailtrail.org.